When touring China, there’s no better place to start than the must-see destination of Beijing. China’s capital city is one of the oldest in the country, and provides a compelling mixture of modernity and historical sites. From shopping districts to ancient wonders, there’s so much to see in this packed city. If you’re stuck with just one day in Beijing, it’s easy to end up spending more time travelling between sites and less time enjoying yourself. Luckily, many of the top attractions in Beijing are within walking distance (or at least an easy metro ride away). If plan your trip properly, you might just be able to get a little taste of everything. As all of the one-day city itineraries around here, a day can scoot by quickly. However, 24 hours in Beijing still provides plenty of time to check out some of the city’s top attractions. Start with the first stop in this list, and then work your way through the city with these suggestions. Preparing for your Beijing itinerary? Don’t forget to protect yourself with travel insurance! 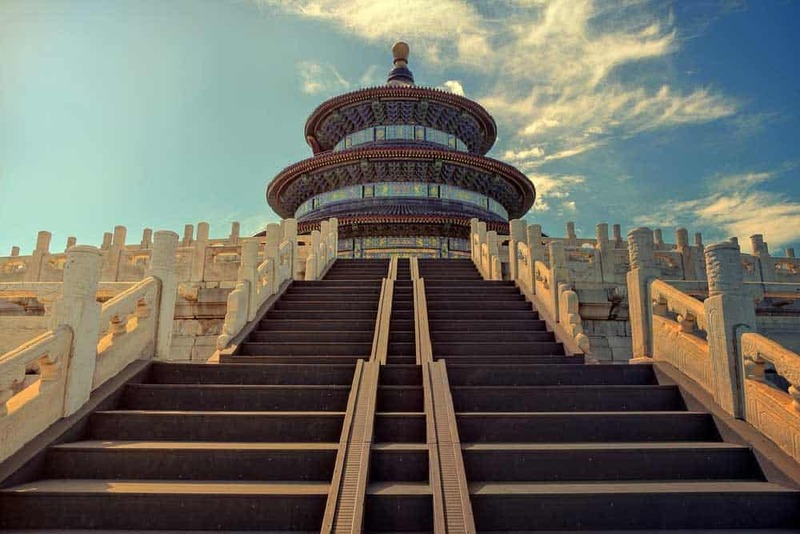 A great place to start your day in Beijing is the Temple of Heaven Park. The park opens at 6am. Arriving early in the morning, you’ll catch large groups—young and old—practicing the Tai Chi. It’s a relaxing way to loosen up and start your day right. You’ll want to stretch out before you spend the rest of the day on your feet. Besides Tai Chi, you’ll most likely see people engaging in other activities. It’s a popular park, and it’s easy to get lost in the sprawling complex that also houses numerous religious buildings. Work your way to the centre of the park, where you’ll find the Hall of Prayer for Good Harvests. It features a massive courtyard surrounding the Vault of Heaven. Early in the day, the area shouldn’t be too packed with tourists. After spending some time walking around the park, take the north gate out of the park and head west. It should only take about 15 to 20 minutes to walk to Qianmen Walking Street in the middle of the Qianmen Residential District. The street runs south of Tiananmen Square and offers about 845-meters of stores. When you look north, you may see the top of the palace, depending on the current amount of smog in the air. Qianmen Street provides an interesting mixture of East and West. You can find traditional Chinese food in historic restaurants one or two stores down from a Western fast food chain. 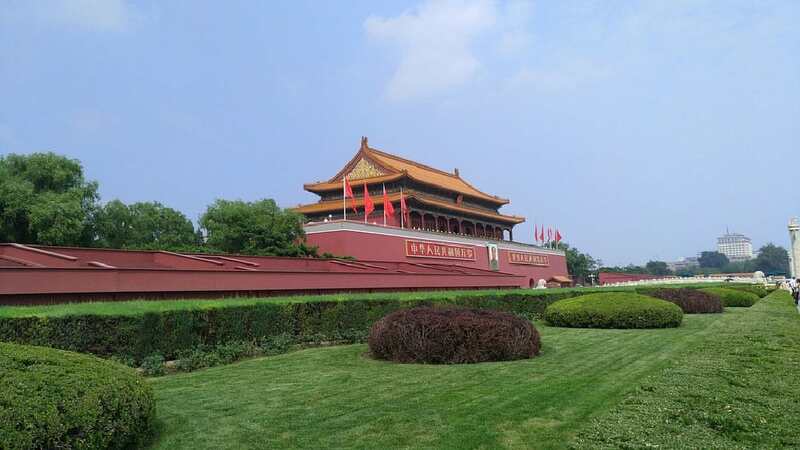 If you head north of Qianmen Street, you’ll reach Tiananmen Square, Beijing’s most famous (maybe infamous?) public place. You should pass through the Archery Tower and a subway tunnel to reach the square. You’ll pass a security check before entering the square. Hopefully, this shouldn’t take too long. Keep in mind that you can’t take photos in the square. You’ll need to pay to store your belongings in a special storage place and retrieve them afterward. 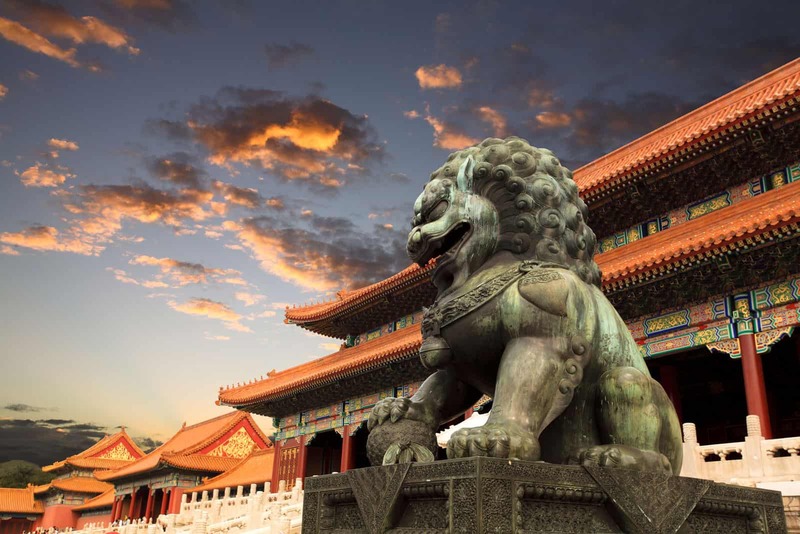 Just north of Tianamen Square, The Forbidden City is a necessary destination to visit, no matter how many days you have available for your China itinerary. You enter through the south gate and work your way towards the north gate. Don’t worry about getting lost, as this is a one-way trip. Everyone travels through the Forbidden City from south to north. As you only have a limited amount of time, you should purchase your tickets for the Forbidden City before you arrive. You can buy them online, which is encouraged. In fact, Chinese residents need to buy their tickets online. If you need to pick up souvenirs, the gift shops and bookstores within the Forbidden City are great choices. Just try not to pick a store with a long line, as you’ll eventually need to continue your journey. When you exit the north gate of the palace, you’ll enter Jingshan park. However, you should first turn left or right and work your way to one of the four turrets of the Forbidden City. You can’t access the turrets, but you can get a better view from outside the Forbidden City. Spend a few minutes looking at these marvels and then walk pack to the park. 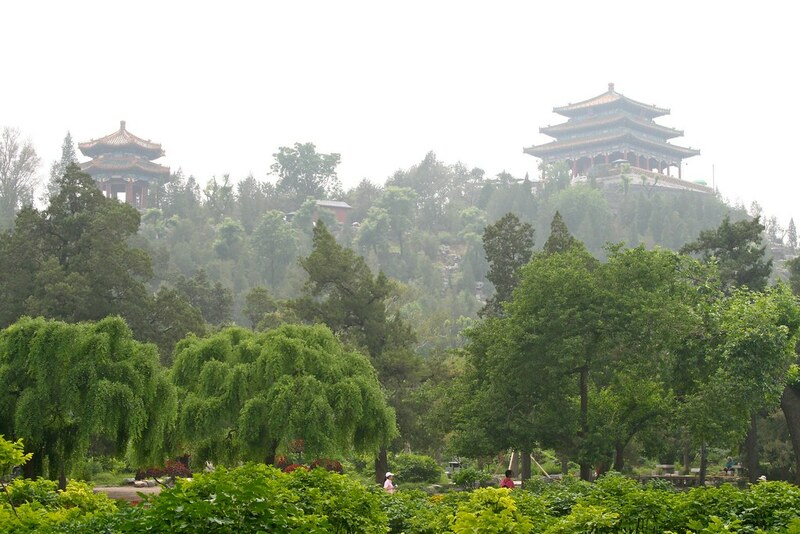 Jingshan Park is also called the Royal Garden. It covers over 57 acres and offers a grand view of the Forbidden City. The park features paved paths and numerous pavilions surrounded by green cypress trees. It’s built on a large hill with five summits. Each summit has its own pavilion. If you get to the center of the park, you can climb to the top of the Wanchun Pavilion. It offers the best view of the surrounding area. When you leave the Jingshan Park, you’ll again want to head north. Travel up to Di’anmen East Street and head west until you reach a bridge. Just on the other side of the bridge is the Beihai Botanical Park. Beihai Park is an ancient garden, built over 1,000 years ago, next to a large lake where you’ll find one of the highlights of the park. 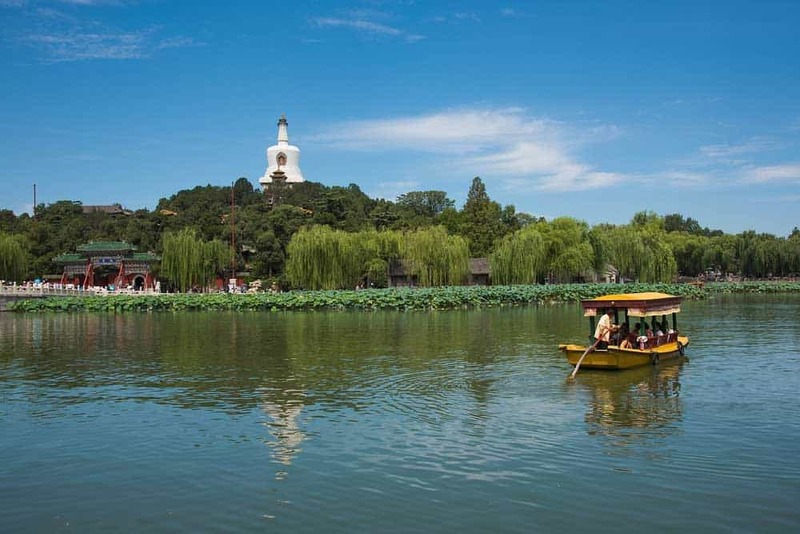 In center of the lake is the Jade Flowery Islet, featuring the White Dagoba. This structure also includes a temple and several other buildings. However, you’ll need to hurry over to the botanical garden. The botanical garden is well-maintained and open the public. It’s the largest display greenhouse in Asia and houses over 3,000 varieties of plants. Depending on how you’re doing for time, you should visit the Circular City. It’s in the South-western corner of the park. You’ll see its 15-foot-high walls as you approach. Circular City includes various pavilions, halls, and towers. It also has a few restaurants if you’re starting to get hungry. You can leave the park through the north gate. If you keep walking, you’ll reach Shichahai. Walking north of Beihei Botanical Park, you’ll reach Shichahai. This is perhaps one of your best chances to experience authentic Beijing culture. It includes many historical buildings, residences, and narrow hutongs. Hutongs are the famous small alleys (almost like courtyards) that cut through most of Beijing. They often include, along with residences, small shops, restaurants, and bars. One of these narrow alleys is called Houhai Bar Street, a perfect little escape to enjoy a few drinks. There are also many alleys containing small restaurants. Search out a restaurant called Kao Rou Ji. It was established over 150 years ago and sells various succulent roasted meats. After a couple of drinks in Shichahai, it’s time for the return trip. Walk back, or take a cab toward Di’anmen East Street, and then travel up to Gulou East Street to Ghost Street. 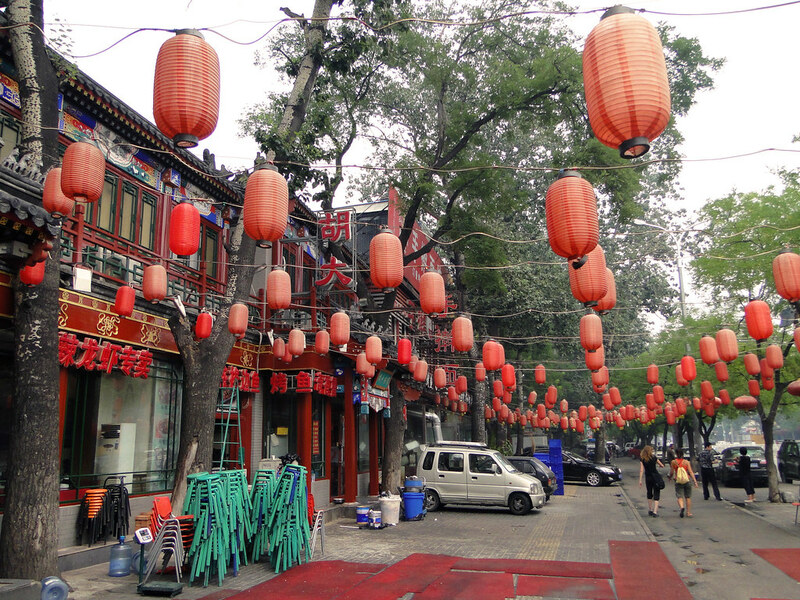 Gui Jie (Ghost) Street is over a mile long and includes over 100 different restaurants. If you haven’t filled up on roasted meats, you can enjoy more authentic Chinese cuisine. There is no shortage of interesting meals to try, including bull frog and rabbit head. Most of the restaurants, however, serve seafood and BBQ. For those who don’t like seafood or BBQ, you’ll pass a few dozen more restaurants on your way home. In fact, there is a good chance that you’ll pass at least a few Western fast food restaurants. If you’re done with your busy day walking around Beijing, head directly south from Gui Jie Food Street toward the Temple of Heaven Park to make it a round-trip. There’s one last stop that you may want to visit during your trip. 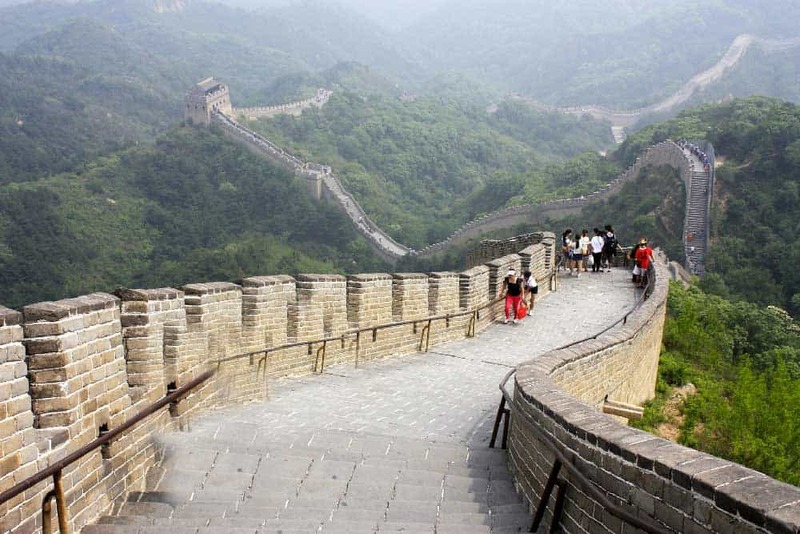 In fact, it’s considered one of the top attractions, not just in China, but in the world. The Great Wall of China is about an hour drive north of the city. Unfortunately, if you stick only with this one-day Beijing itinerary, you may not have time to view this ancient wonder. Most of the sites along the 5,500-mile wall close between 5pm and 7pm. If you want to include the Great Wall on your walking tour of Beijing, you’d better leave for the wall after your stop in the Forbidden City. Skip the parks and art district, and depart as early as you can. Otherwise, it’s never a bad idea to add on an extra day in Beijing to fit it all in with fewer time constraints! With over 20 million people in its metro area, you’d better believe that choosing where to stay in Beijing isn’t an easy task! Accommodations are spread over a wide area with every neighbourhood showing off a different side of the city. 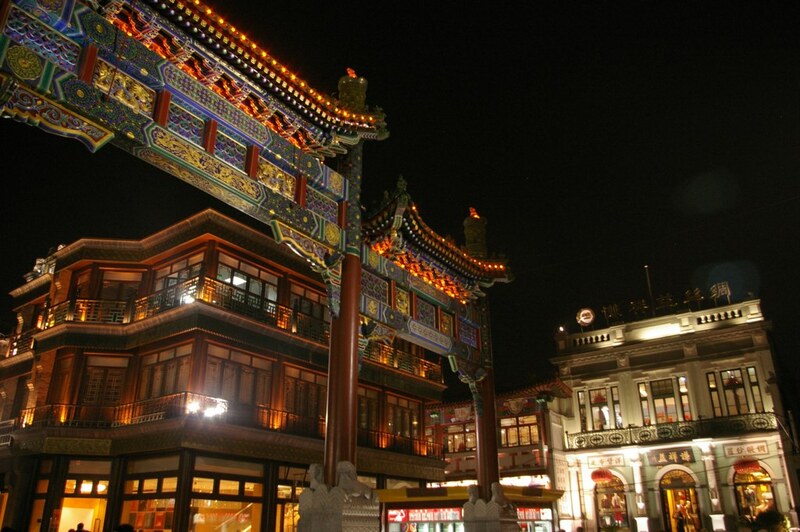 For travellers with just 24 hours in Beijing, the city centre is the best place to stay, particularly the Dongcheng and Qianmen areas. Both of these areas are close to the stops in this itinerary. ibis Beijing Tiantandongmen Metro Station Hotel: One of the best places to launch this Beijing itinerary, this budget-friendly hotel sits within walking distance of the Temple of Heaven and Tiantandongmen Subway Station. The rooms here are ultra-modern and comfortable. New World Beijing Hotel: A fantastic mid-range option about a 15-minute walk from the Temple of Heaven Park entrance. The sleek & spacious rooms here are only the beginning. Float around the indoor pool, sweat out some Peking duck in the sauna or chill out with a relaxing massage to get the full experience at this hotel. The Peninsula Beijing: Quite possibly the best luxury experience in the Orient, this delectable 5-star hotel raises the bar for all others in the city. The spacious suites shoot above and beyond any in the city. Other treats include a heated indoor pool and several on-site restaurants dealing in traditional Cantonese, modern French and international dining.